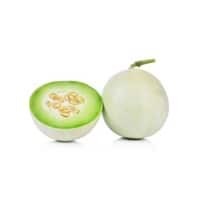 Honeydew melons are rich in Vitamin C, potassium and B Vitamins such as thiamine and niacin. Containing about 90% water, honeydew melon can help keep you hydrated. Look for honeydew melons with a waxy rind. The melon should feel heavy for its size and the surface should give slightly to pressure, bouncing back quickly when pressure is released. Avoid melons with a fuzzy rind. Store honeydew melons at room temperature. For cut melon, store in plastic container in refrigerator for up to 2 weeks. Grab a knife and cut your melon in half, making sure to cut through the stem area. Remove the seeds and cut melon in wedges. Cavaillon, a town in Provence, France, considers itself the world capital of melons. The ancient Egyptians regarded the honeydew as sacred and it was only reserved for society’s elite. A less common type of honeydew has an orange-colored flesh.